Let’s face it... pirate parties aren’t just for little boys anymore. Girls don't need to be afraid to cross the gender line into the pirate theme when you add accents like stripes and swirls into the mix and choose a show stopping color like hot pink. The metallic pink envelope has an envelope icing piece that wraps around the side endge so that there is design on the front and back of the envelopes. This is a great way to introduce your theme right from the start. 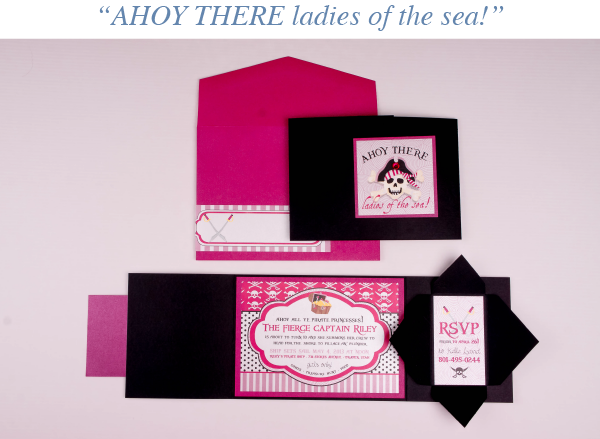 Once you pull the invitation out of the envelope the first thing you see is a skull and crossbones pirate with a bright pink jewel on it’s hat saying “AHOY THERE ladies of the sea!” Once opened the theme keeps flowing onto the invitation with printed patterns of skull and crossbones, bold pink colors and clever wording as to what the guest of honor “THE FIERCE CAPTAIN RILEY” will be planning for her fellow princess pirates. Lastly the RSVP details are hidden in a four-fold wrap on the right side that has to be opened up to see what's inside. We thought this would be fun to have a hidden element within a pirate and treasure chest invitation. Our next two invitations are a girls version and a boys version of a "ticket" invitation. We've taken the familiar shape of a ticket but made it really big - like 6 x 9" big and the ticket becomes an oversized invitation. With both invitations shown the giant ticket sits in a metallic pocket. A band wraps around the pocket and a round sticker is placed front a center over the band. All of the pieces are, of course, made to match the theme of the party. The pocket is also great for holding extra pieces like the reply card you see in the pink carnival invitation. This fun idea of giving your guest a ticket to your themed party is just another great creative way to get everyone excited! We also printed an adorable thank you card that was made to match the carnival themed party. Remembering to thank you guest for attending is always a great way to show your gratitude! I have to admit the next two invitations are my favorites. The invitation on the left is for a girl's “spa party!” and let's be honest who wouldn’t jump at a chance to attend this party. The invitation is a die cut of an eye mask on metallic paper with details printed on each side of the mask. A ribbon is glued through the middle so that the eye mask can actually be tied around little heads and played with. I love the simplicity of this invitation and how the design was able to say it all without saying a lot. The great color pallet along with the stripes and polka dots set the feel for a spa day and the envelope liner gave it that extra pop to complete this invitation! 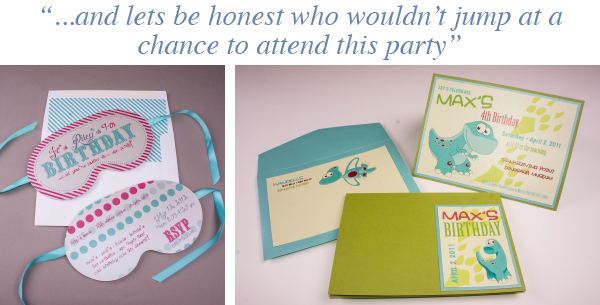 The invitation on the right is a little boys “Dinosaur” themed party. We added thickness and style to the envelopes by adding a printed layer for addressing. The front of the folded invitation is decorated in the lower corner with a metallic layered piece designed with the dinosaur theme and big dino footprints. The pops of blue and red added to the green dino theme make this invitation just adorable. Opening it up the layers of metallic blue with the printed invite on top mirrors the flow of layering throughout this whole invitation. The last one we're sharing today is another example of using design on the envelopes to set the tone for this themed birthday. The first thing you see when taking the invitation out of the envelope is the design card with a chief’s headdress declaring it’s “MAX’S birthday”. We used a metallic green three-panel pocket to hold the invite and added a dark blue backer behind the invitation to really set the colors off. 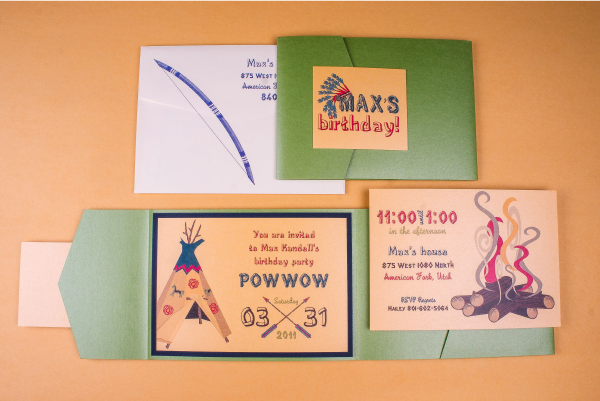 A details card in the pocket gives the guests (and their moms) all of the details for this little boys “POW WOW” themed birthday party. With all the different themes to choose from it becomes an endless sea of creativity that keeps the team at Ann Elizabeth on the cutting edge of custom printing and design! So if you're looking for something unique that will have your guest talking about your party let us help you in creating the perfect invitations for you event!